If you missed Big, Loud, Live this year you missed another wonderful year of drum corps performances. By Saturday night a new DCI World Champion will be crowned and the drum corps world will begin the long wait until next spring to satisfy their hunger for more DCI performances. We've learned over the years that the smallest details matter in a DCI show and even the smallest gestures of one's own body could make or break a championship season. Last night during Big, Loud Live national audiences across the country sitting in movie theaters were treated to a spectacle of performances led by the front runners, the Bluecoats. During their performance a Bluecoats trumpet soloist pulled off the moment every trumpet player dreams of doing. Destroy a high note, find a video camera that is only focused on you and break every girl's or guy's heart by winking straight into the lens. 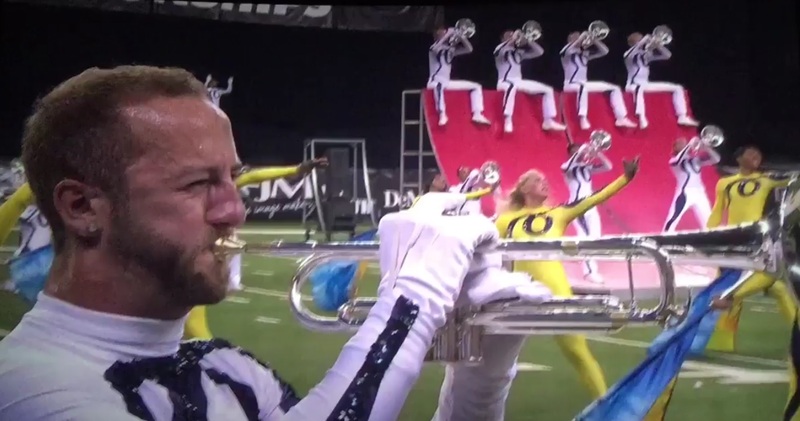 Shout out to the sly Bluecoats trumpet soloist who snuck in that wink to the camera. Good luck to all the corps as they march towards the end of their season.